This entry was posted in Complain. Bookmark the permalink. Just to make thing clear, I am sure Mr Ng is not saying only in his own interest but in the interest of all the residents here in regards to safety. The RA has been entrusted by the residents to maintain safety in our Taman. What I don’t understand is why did you said that the aunties also very concern with their safety but at the same time wanted the key knowingly if the RA is to give them the key, other residents may follow suit and in the end, the east gate is no longer secured. I understand everyone in this world is selfish, but some are only to the extent that do not endanger others people’s safety. Basically i am neutral in this case, but i just do not want anyone missuse their authority by saying not to other and not even try to convince or make them agree on it. It is not the RA don’t trust the residents here, please don’t misunderstood. What the RA is trying to prevent is what if the residents forgot to lock the gate and criminal gain access through the gate and cause harm to any of us? Who is to be blamed? I can be sure you are the 1st one to point the finger at the RA. The RA has compromising a lot already to allow the senior residents to use the gate at certain timing. By allowing only a single point of exit & entry is the most effective way to minimise outsiders from coming into our Taman with intention to cause harm to the residents & also minimising maintenance cost. By having another point of exit & entry means the RA need to engage more measures to guard that point and this will definitely increase the maintenance cost. By allowing a only a certain group of residents to use that gate means the RA is misusing the authority given to the RA and not the other way round. Do not misunderstanding what i meant for the fencing which seperated the playground from Phase 8A. it is not to say who are the one who decided on it but i just want to highlight that human are always look into their own interest and right according to the law given. There is not right/s one people to stop another from having their rights as long as they are not againt the law.This is aplly to the people who do not use the east exit and asking people to sacrify with the simpliest way for their own sake. The people who request to have the key are even more concerned about their security as they live nearest the east gate as compare to you. That is their rights to have a key for their convenient to exit to the shoplot. We should make them understand by lock back the gate after every use and do not duplicate the key to other. it seem like you want other to sacrify for your own safety. Human are selfish, regardless you or me. We are not trying to deny any resident’s right for access through the east gate, we just wanted the key to be handled by the security guards who were there 24 hour a day, and passing by the east gate every single hour like the scheduled commuter bus that everyone familiar with, and for lunch hour we open the gate from 11:30am–1:00pm, in case of emergency just call the guard house, but the problem is all our proposals, due consideration and arrangements were not acceptable and rejected out right by the group of 10 senior citizens, all they wanted is the key and nothing less than a key, as simple as that. This random hassle free access will post the biggest challenge or detrimental to our gated and guarded community concept. As the name implied, the community living is a fenced up so as to be gated and the gate is guarded with security guard, just like any check point you need a static guard to control the passage of the people, so if everyone got the key without the watchful eye of the security guard, then this move is certainly detrimental to the concept of gated and guarded community. Even our main gate which is fully equipped with electronic access card reader, barrier boom gate and CCTV, we still need static guard to monitor and handle the situation. what more to say on the east gate with the absence of any static guard and electronic surveillance setup. As you know the primary objective and function of the RA is to uphold and manage the concept of gated and guarded community in our taman. So Lawrence, do you think handover the key is as easy as you think? how do you satisfy the rest (78%) or majority who oppose to your request. please advise……. understand yout situation, anyhow i felt that we do not do the best effort to explained to the peoples who disagreed and to the peoples who will get the key to make sure lock the east gate after every use and do not duplicate the key to other. We just simply change the lock and not even do the ground work first. Pls take note the previous lock was placed by the main contractors and it could already duplicate too many and until unable to trace. 1st of all, we are grateful for your understanding of our RA’s situation on this matter. It is not our intention to cause inconvenience to the group of senior residents or treat our Taman like a prison. I believe if we were to get the opinion officially from all the residents, you may feel that it is unfair because there are more residents living far away from the east gate than those who live near to it. Another concern is that if the RA decided to give even just 1 key to a resident, the other residents sure will follow suit by giving the similar or same reasons. Our RA will not be in the position to reject others’ request anymore. I do hope we can reconcile and meet half way, ie. please ask the group of senior residents the best timing to open the east gate for them to do their chores at the shoplots. The RA committee members are very concern with the views from all residents, including yours. 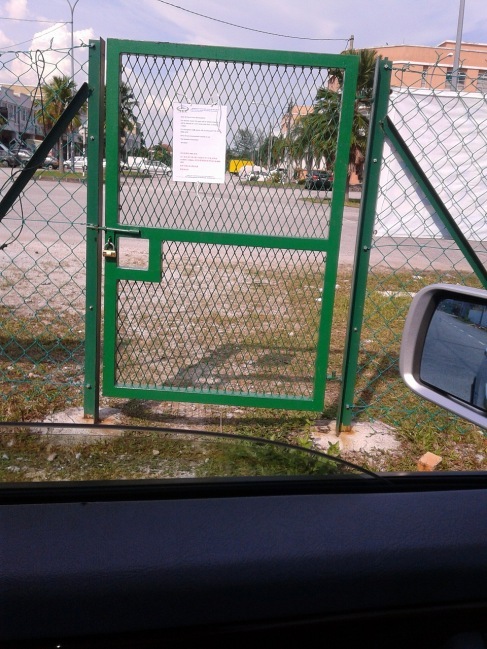 The developer have decided to build the gate is to satisfy some of the purchasers’ requests but they do not take into account of the safety of the residents because they are not living in our Taman. Since we have voluntarily taken up the duties to run the RA, we are doing our best to ensure the safety is our top priority. However, we are not here to restrict the movement of any residents, that is why we have suggested to open the gate at certain timing to answer to the requests from some of the aunties. Any criminal person can come in & out of our Taman through that gate if we don’t control it and if any unwanted thing happened to the residents, including the aunties, we might regret the decision to not control it. On your suggestion to put a card reader at the gate, well, there is no electricity connection at that gate and to connect one means a lot of application need to submitted to the relevant authorities, not to mention the cost of installing an access card system. May I suggest you ask the aunties, since you are representing them, when is the most frequent time they need to use the gate and we, including you & the aunties, to agree on the best timing to open the gate. Those who need to use it on other occasion or timing, just give our security guards a ring and they will try they best to go there, as soon as possible, to open it. We, the committee members, are all your neighbours, whatever we do is in the best interest of all the residents. Unlike those condo / apt where the security services are run by the a management corporation, they are applying ‘no compromise’ to the safety methods, not our RA run by the residents ourselves. Understand who disagreed to give key to the residents are those who do not need to use or even not different for them to use main gate compare to side gate as they are lives far away from the shoplot. Anyhow, we definately cannot seized out the need who want to exit from there as it is part of the reason i bought the house here as it convenienced for my family to go to the shoplot. There is not time frame for them to use the exit as we are not in the prison or Kampung Baru during world war 2. Frankly speaking, I’m not agree with what do you meant by prison? Prison mean you lost all freedom to do any thing, not just close the side gate. Please do not use your own convenience and make others resident worry about the security of 8A. Numerous houses was broken in since beginning , some even with security alarm system. The RA is trying to give everyone a safe and peaceful home, other wise why the autogate, cctv, spot light were installed and so much effort had been done just to tighten the security and safety. I’m stay in condo before move to 8A. The shop lot is just at the north side but main gate is at the west side, there are so many senior resident stay there and walk over there looking for breakfast, convenience shop, etc. the distance is about the same. Others can adapt it why we can’t? Just in case, any criminal happen who will responsible? I think it’s too late to say who responsible any more. anyone here really sacrified by not using the side gate in order to achieve better security or bassically they are totally not using it at all but ask others to sacrified for their own security. We should understand that the people who use the side gate also concern about their own security, but they decided to have the key in this case. I think you have read in the newspapers that almost everyday about the news of kids being kidnapped and people being stabbed during robberies. I, as a resident, will not compromise the safety of my kid for convenience sake and I can safely say that most residents here would have agree with me. I don’t mind my house being burglarised but I don’t want any harm come to my family. We are living in the time when the threats that are not much different from the time of WWII / communist time in term of seriousness of threats to safety. FYI, I also have an ‘auntie’ at home, it is boiled down to how well we plan our daily living activities in order to minimise the interruption to the security facilities that we paid with our hard-earned money. By saying ‘we & our’ here, I mean all the residents. And, yes, I am living at the other end but that does not mean that i don’t want to use the side gate if it is opened for all to pass through freely. It is good that the developer has installed a gate there for our convenience. But when come to security issue, we as the owners still has to take our own initiative and responsibility. Do you think developer will care about this when they are not even providing a proper guard house to us? Solely understand on that, and i am the one who aggreed on the guarded as well. I was told by the developer that a small door will built near the shoplot and the developer delivered their promise as well. By then, now we are controlled to use side door and this is againts the promised made earlier. Beside that, you still insist that the side door to be locked and the key was not given to the necessary resident is the “majority” decision as per internet pole. This is somethings i strongly disagreed. We have 77% poll result against your 22% how do we justify the decision to give free access ? Mr. Lawrence, you are right in one way that this poll do not reflect actual majority. But the referendum that RA receive from all the owners has reflected that they want tight security. This majority has contributed their portion for the security as well. So before any decision being made regarding this matter, they have the right to be informed. I suggest a survey form being distributed to each of the owners to get feedback from them. About the matter of convenience, this is only your personal perspective. What about other senior residents who live far away from the shop lot? Their voice need to be heard as well. In this case, the shop lot just happen to be there. Why not people plan their time according to the gate open hour? We can suggest a longer open hour or even 2 open intervals. Anyway, giving away the key is still 1 of the solution, but as what I said above, every owners need to be informed about this. Otherwise, RA will have to bear full responsibility if anything unwanted happens in the future. you are right, only the people who live near the shoplot/side gate will need to use the exit. We cannot neglect their need even they are minority. There are people who live far away may looking for their own interest but neglect the actual need of the people who need to use the exit. This will be an unfair polling in this case. We should find other alternative rather than lock the gate. Morever the place is public place and we put fencing surrounding is already seized out other people rights who do not live in the Phase 8A by using the playground facilities. This issue will definately bring out upon there are people staying at Phase 8B. Please be specific on the discussion topic. The decision to divide the playground from Phase 8B is not comes from RA. As i mentioned before that the internet pole does not really reflect the actual vote of all residents in the Taman. But you insists that is the majority, meanwhile, i feel that the action of putting the lock and the key kept by you should conduct after getting the real”Majority”. Is not me to proof that the real majority but should be the people who wish to make the changes on the existing condition (Whereby some resident do have the key to access through the side gate). Am i right, Mr. chairman. Mr Lawrance Lee, the RA chairman Mr Kong is not Chairman Mao Tze Tung of communist China, we have a committee, comprsing of 11 zone leaders to consult and a poll to guide us. when we are spending RM8,0000 a month to hire the guard on 24 hour basis and to have installed some RM50,000 of equipments on excess card, motorized boom gate, and CCTV-DVR. and we also pledged to have a tight security check point which was envy by many others, Do you think it is easy to make a decision against majority view and putting risk or loophole at our own back yard? Since you are the representative or spokesman for the minority group wanted to talk about democracy, so can you gather signature over 50% of the residents pro to your suggestion, than it will be easy for the committee to decide. Meanwhile, we are working on some formula after hearing feed back from our committee members hopefully it is acceptable to you and the aunties who had come to see me. Understand that only the RA had the authority to post on the blog. Anyhow, on behalf of the senoir uncle and aunty, i would like to raise out that the poll do not really reflect the actual wish of their decision whereby they may do not use the internet. Sad to know that these uncle and aunty walked few times to Mr. Kong house and request for the side door’s (near shoplot) key but was rejected by him. I can understand the necessary of the key by these senior residents as they need to walk to the nearby shoplot through the side door rather than a long distance from their house to the shoplot through the main gate. Most of the senior resident do not drive like us, we should understand their situation especially when their children are out to work and the only way they go to the shoplot is by walking. Realised that we also worry that the key may missused by unauthorised peoples, if that is the case, we should find a solution for this issue rather than put on the lock and limit the freedom of the senior residents who really need to use the door. Example an acess card system plus lock at the side door. Lastly, i hope that we are staying in a guarded community but not gorverned by the ” communist” as it seem like we are “illegally quarantined” within the area and the freedom of the people inside is monitored and controled by other. Yes, thanks for the good idea. hope more of these to come.